Each course will start at 8 am, Saturday morning in the conference center, with an open social at 6 pm, the Friday night before, also in the conference center. WE ARE ASKING THE STUDENTS WITH BIRTHDAYS ON EVEN NUMBERED DAYS TO ATTEND THE FIRST WEEKEND AND STUDENTS WITH ODD NUMBERED BIRTHDAYS TO ATTEND THE SECOND WEEKEND. Backpacking Students who attend the first weekend will backpack after the course, the students who attend the second weekend will backpack prior to the course. Certification In order to certify in Hiking Backpacking and Trekking medicine, students must take the course and pass the certification exam that will be given at the end of instruction. Opening Social Friday night We will provide dinner. Students will meet at 6 pm at the Hampton Inn and Suites in Springdale, Utah (Outside Zion National Park) for an opening social. Students will get to know each other and become familiar with the area. We have chosen this area because it is early in the backpacking season and this give the best chance of having good weather. It is low in altitude and in latitude. There are many places to hike and many places to camp and also there are hotels. Below are some links to help you find places to camp, hike and hotels to stay in. Remember, we have reserved campgrounds at the Watchman Campground Friday, Saturday and Sunday nights on both weekends for students enrolled in the course. You can check and see if there are openings for friends and family with the course director. Here are some other options for friends and family to share. This will be ‘frontcountry’ classroom instruction at the base camp focusing on (1) backpacking skills and (2) basic survival skills on Saturday and Sunday. We have reserved 12 campgrounds just inside Zion National Park for 70 people for Friday, Saturday and Sunday nights only. These are the Watchman campgrounds. We have units on C and D loops. Each campground will hold 6 people, two cars and three tents. They are pretty strict on that. There is no charge for this. We are aware that many of you are going to be with friends, family and others. We are going to try to hold positions for students first and friends/family after that. Email us to let me know if you are staying in one of these. If you have friends, let me know that. The park ranger will tell you which campground you are in once you get there. I just need to know a general number so we don't go over. There is a forum below, where you can contact other students for rides down and someone to camp with. If you need more camp sites, there are a number of campgrounds and motels in the area. Look at the links above. Students will begin hiking on Monday April 24th and should be back on Friday April 28th. Students will be responsible for their own equipment and their own food for backpacking. There are a number of day hikes and a number of longer hikes in the area around Zion National Park. Students more familiar with backpacking will be able to organizing into small groups and go on longer hikes. 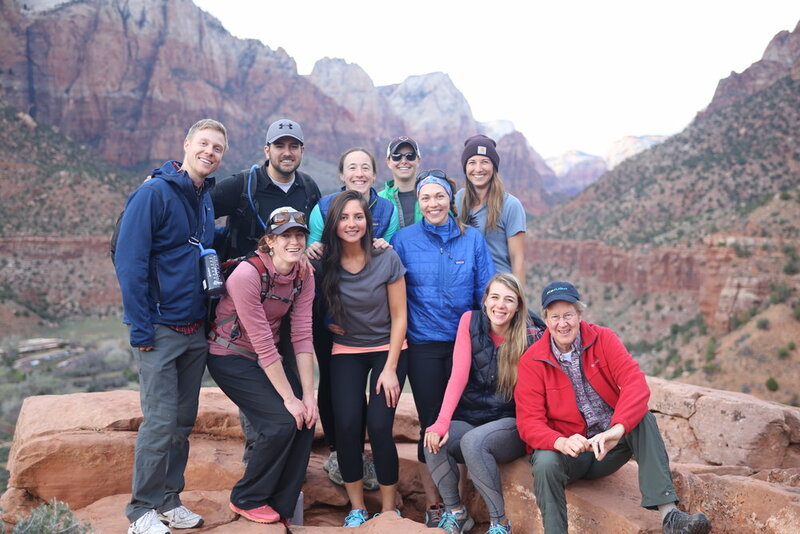 (2) A few group trips of 5 – 6 people led by instructors outside of the park. (3) Several overnight trips for people interested in getting more into the backcountry. (4) Participants can plan their own trips within the park. You will have the opportunity to meet people during the first few days of instruction. Students are responsible for their own travel and expenses to and from Springdale, Utah. People would like to carpool down from Salt Lake City or other locations. You might also have questions about who you could hike with, or where you are going to hike, etc. Since we cannot give out email addresses, we have prepared an open forum for discussion so you can try to coordinate this amongst yourselves. Click on the link above to go to the general forum page. Then click on the "General Discussion" link to see the forum posts. You are also free to email me and I will try to hook you up with other people. Also, you will meet people there and can hook up to go on hikes with them. There are numerous lists of things to bring on backpacking and hiking trips. To help you with planning here is a link to a site that will help you plan. When you arrive in Springdale, you will be able to talk to others and see what they are bringing. We will also provide instruction in this area. You can purchase gear in the Springdale area.